We're still catching up with things here after a hectic Sebring week. Here are some images, forwarded by Stuart Scott, of his beautifully turned out Jaguar-bodied V8Star, at a test last Friday at a very cold Silverstone. 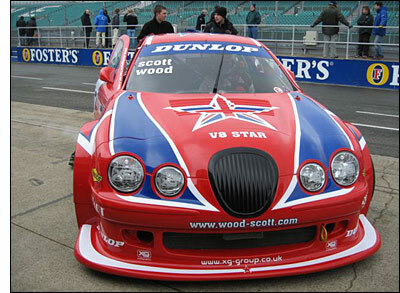 The day went well with Stuart Scott sharing the car with Mark Sumpter (Steve Wood was away on business). Scott carried out the bulk of the driving as he prepares for the Britcar / V8 Challenge Media Day on Friday - "but Mark couldn't wait to get his hands on the beast". You'll be able to keep up to speed with the season's action aboard the Jaguar, both in the UK and in selected European events, right here on dsc, in our free-to-view area.